Whether you’re shooting to hone your ability to defend yourself or just for fun, your time at the range is too important to cut short because you’ve run out of ammo. There’s the rub, though -- ammo isn’t exactly the cheapest common household necessity. 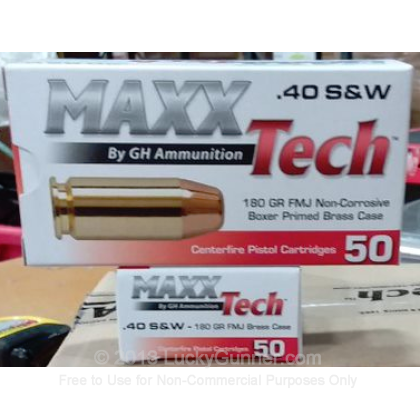 If you’d like a round that you can afford to run through your pistol all day long, then check out this 40 S&W ammo by MAXX Tech! It’s made by Pobjeda Technology, who since 1952 have built up the kind of high output facility that lets them make a range of budget-friendly products. Unlike a lot of the cost-effective ammo you’ll find out there, this round sports both a brass casing and a non-corrosive Boxer primer. The 180 grain projectile dons a full metal jacket, a factor that contributes to reliable feeding and which will preserve your pistol’s accuracy over the course of a long range day. Check back if you become a fan of this affordable round, too, because we also sell it by the case! We also have this 40 S&W - 180 Grain FMJ - MAXX Tech - 500 Rounds ammo in stock in a bigger quantity.